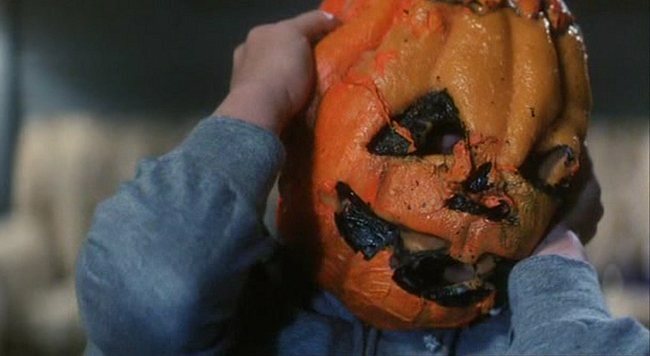 The first thing that immediately comes to mind when I think of Halloween III: The Season of the Witch is the old Shakespeare quote “What’s in a name?” Apparently the answer to many a film fan, especially devotees of the horror genre, is a lot. The fact of the matter is I cannot completely absolve the decision to tag this film as part of the Halloween franchise, however, I do not feel it defines the film. In fact, the first time I saw this film was during a Halloween marathon and I had no prior knowledge so I did keep waiting for Michael Myers and though I eventually realized he would not be there it still didn’t ruin the experience for me. The sad part is the title cost the film. If it had just been labeled Season of the Witch, which has every bit as much to do with it as Halloween (which is not a great deal), people might’ve been able to judge it for what it is and maybe there would’ve been a sequel to examine the aftermath of the diabolical plan. It also caused Part 4 to be subtitled: The Return of Michael Myers because this film had been lumped into the series. It’s hard to think of a horror concept more perfectly suited for the 1980s. It all hinges on commercialism and cynicism surrounding consumerism. Yet it is also in a way about the ubiquity of television in a day and age when there was no real choice, which plays brilliantly into the plot. Like many films in the series, however, it does deal with the countdown concept of the approaching holiday. It does so more effectively though as the countdown to Halloween is an intrinsic part of the story which is embodied in a catchy jingle and as we learn more the jingle becomes more and more dreadful. Perhaps another place where there is a disconnect surrounding this film is that it operates on a more antiquated notion that explanations are overrated when the occurrences within the tale are frightening enough. What is the goo? Why are there spiders? How can the stones target their victims? These are all questions that you walk away with but the answers are virtually irrelevant. What matters is the impact of the story, which is massive. I’ve seen this film a handful of times and the end still leaves my skin acrawl with goosebumps. When you get right down to the nitty gritty of horror most people are only concerned about one thing: the kills. Some of them in this film are truly memorable and one, when you learn the nature of the mask, is truly iconic. While within the chronology the film does get to October 29th rather quickly the information does mount steadily enough from that point on that the pace never does suffer. The music in this version, though also a departure, is quite successful and the return of Dean Cundey behind the camera assures some brilliant imagery. What is also interesting is that the city of Santa Mira where the Silver Shamrock factory is located is rendered as sort of a cinematic precursor to Gatlin, Nebraska in the Children of the Corn. Its citizens virtual automatons who are functionaries of the company and who look with disdain on any outsider. There are concrete facts that could be discussed further but what is most interesting about this film is that it floats many big ideas: How this could possibly be the last Halloween, The size of the cataclysm intimated by what the TV ratings may be and also the notion of simulacrum as a few times on TV you see that the world premiere of the Halloween will be airing. This is a film that while it doesn’t technically belong within the series is still one that ought not be overlooked or underrated. This retrospective is valuable in part because it has allowed for revisiting of many titles. This particular film was one I’d seen in a very piecemeal manner, which is no way to see any film but especially when dealing with a concept like this. Seeing Child’s Play in pieces will only highlight parts of the narrative which suspension of disbelief will get you through. Structurally this film works absolutely perfectly. Things move along at a brisk pace and cause and effect up until the climax are very clear. All you really have to get past is your own faculties of reasoning and you see that many things in this film do in fact work. Now while as a child, who was not technically supposed to be seeing any part of this film, it did scare me, as it should, even removing that it still works whether you are scared by the subject matter or not which is not always the case with horror films. Disbelief amongst characters is a factor in horror films that can be quite frustrating. When evidence is piling up and events that defy rational explanation are happening but people don’t believe it can be frustrating as an audience member. This film deals with that notion in an interesting way. The reveal of Chucky’s nature to Andy is rather slow. Andy’s not doubted long before his babysitter meets her untimely demise. It’s a kill of a character whom is not disposable, someone who we have met and liked so it’s effective. Though Andy is refuted both by his mother and the police but his mother quickly sees the light. The reveal of the doll missing batteries after Andy is held for examination is visual and stunning. Similarly Detective Norris’s doubts are allayed when he narrowly escapes death at the hands of the possessed doll but he plays it close to the vest upon re initiating contact with Miss Barclay. So very slowly but most importantly steadily the circle of believers grows. As the circle of believers grows so does Chucky’s rampaging. Another asset this film has at its disposal is a distinct set of rules, which are blatantly disregarded in the sequel, and the antagonist’s want is clearly defined. Conversely Andy’s need changes, at first he wants the doll then he wants to be believed and wants to be with his mother anew. All the comedy of the film comes through design. The only things that truly hold it back are that the final showdown with Chucky is overly-long, as he appears to be vanquished twice and comes back to life but it is allowed to be that long because all those fighting him weren’t recalling or acting upon the biggest rule given to them by the dying witch doctor: shoot him in the heart. It’s not until his last stand that attempts are made at that hit. Otherwise, though it is a truly effective and accomplished work by director Tom Holland and his two co-writers Don Lafia and Don Mancini. What is interesting to note about the second Halloween film is that much like the Friday the 13th series it rewinds and replays the end of the previous film. This film does so to great affect because it doesn’t go back too far or splice it up it only backtracks the necessary amount to be able to continue the story in exact chronological order. So in the world of this film it is still October 31, 1978 and the film does a tremendous job in creating a very believable continuity in all aspects. Much like the first film, and many horror films, there is an homage on a TV and you see clips from Night of the Living Dead. Part of what makes this film interesting is that it starts with the media not yet having released that it is Michael Myers. So his legend is not yet re-popularized, which does mean you need to make a leap of faith when you see that someone is walking about dressed like him. The first seems to indicate the jumpsuit is acquired from a trucker. This potential hole aside the scene is still tremendously effective because later you do see the medical examination of the charred corpse and also because it ends up being Bennett Tramer, Lori’s crush who is merely mentioned in the first film. This is also the first real taste you get of the vilification of Dr. Loomis. The police show a lot of, if not infallible, patience in the first film. Here Myers affects them personally and they lash out at Loomis. The flow of news that’s being disseminated is very well handled from news stand ups to snippets overheard from a boom box. It reflects the widening of Myers’s scope. While this widening is well handled it’s part of what makes this film not quite the first. While it is very chilling throughout there was a certain sense of claustrophobia that was created by focusing on two babysitting assignments on either side of a street in the first film that is better and absent here. The cinematography in this film is perhaps even better than the first. An advantage of the changed scope is that Dean Cundey is given a wider variety of canvases upon which to paint. What propels the series in this edition is the twist it provides. It provides Michael both in the original and in this installment with motivation that goes beyond just simple revenge. It is also different as it provides a twist to the nature or identity of the victim as opposed to the villain. There is more, however, which makes this a truly special film not only in horror but in the realm of sequels. This film also has an iconic moment, more a concept really, and that is finding the word “samhain” written in blood on an elementary school chalkboard. What is perhaps best about the character of Lori Strode is that she always seems to very genuinely connect with the audience, which is not merely a function of her being played by Jamie Lee Curtis. It is also due in part to the fact that she very often reflects the audience’s thoughts: “He is the Boogeyman,” or in this film “Why won’t he die?” and because it’s Jamie Lee Curtis it sounds like a genuine question and not a punchline from an Austin Powers film. Lori is also able to distract Michael long enough to get him offguard by showing she knows who he is. In what could’ve been a move that took it over the top Michael is shot in the head and blood runs out of his mask’s eye holes and represent the tears he cannot shed. It does work, however, because his action belies that seeming representation of emotion. However, he was stopped when he saw he was recognized. This film also makes Loomis, despite all the failings he’s had whether they were his fault or not, its hero as he manages to stop Michael (or so it seems) even in the final confrontation there is a great image and moment to be had. While it doesn’t quite live up to its predecessor it does do right by the story, concept and its characters.